Step one: Draw a line between half the tip chord and half the root chord (green line). Step two: Add the length of the root chord to the tip (blue line). Step three: Add the length of the tip chord to the root (blue line). Step four: Draw a diagonal line between these points (red line). Step five: Where the half chord line and the diagonal line meet draw a line parallel to the chord (blue line). Step six: About one quarter (25%) to one third (335) of the chord at this point is the Center of Gravity for the wing. Draw a line through your selected starting CG perpendicular to the root of the wing. Balance the plane along that line. NB: See note below about the 25% to 33% range. Step 1 - On a scale drawing of the wing, draw a line that divides the chord of the wing in half, root to tip. Ignore the cuff at the Mustang's wing root and follow the LE all the way to the CL. Step 2 - Measure the chord of the wing at the root (ignoring the cuff). Draw a line that length BELOW the chord of the wing at the tip, in effect adding the root chord to the tip chord. Step 3 - Measure the chord of the wing at the tip. Draw a line that length ABOVE the chord at the root. Step 4 - Connect the ends of the lines drawn in steps 2 and 3 with a straight line. Now, where the line in Step 4 crosses the line drawn in Step 1 draw a line parallel to the root or tip chord. This is the Mean Aerodynamic Chord of the wing, or MAC. About 25% of the way back from the LE on the MAC lies the CG. Extend a line from the root through the CG point to the tip, at right angles to the CL, and the airplane can be balanced anywhere along that line. This is the method in Martin Simon's book (and others). Seems to work and it's easy to remember. You'll notice I said the CG was "about" 25% of the way back from the LE. These C of G calculates methods focus only on the wing. What we're really doing in the diagram is finding the aerodynamic center (a/c.) of the wing which, if there was no horizontal tail and the wing tips were reflexed slightly (a flying wing), would be mighty close to the CG. However, the horizontal tail provides a stabilizing contribution to the overall stability of the airplane and moves the CG rearward slightly. For most monoplanes of normal configuration the most aft position of the CG, called the neutral point, including the contribution of the horizontal tail, is approximately 33%. So, you might want to say that the CG of a monoplane of normal configuration lies between 25% and 33% of the MAC, measured from the LE. Chuck Cunningham, the R/C Modeler columnist, stated it just that way in one of his columns. In the best cut and try tradition of Aeromodeling, it is suggested to put the CG at 25% for initial flights and moving the CG aft in small increments if the airplane feels sluggish in pitch, or runs out of up elevator on landing. 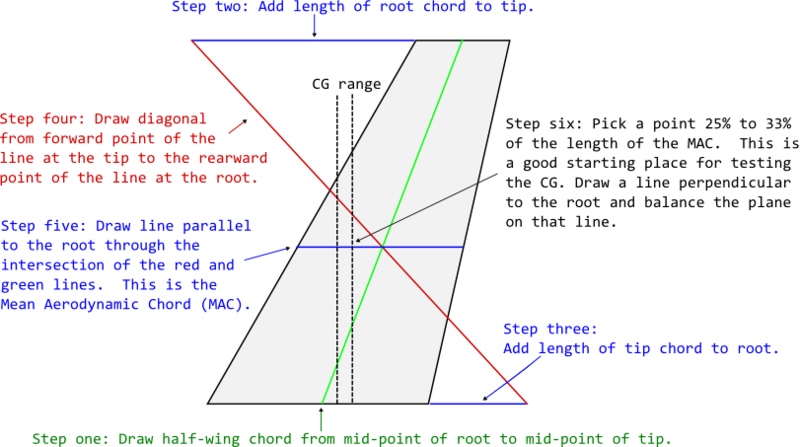 Delta wings have no horizontal stabilizer so in a way they are a flying wing with an extremely low aspect ratio... so they must follow some of the same airfoil and CG layouts of the flying wing. This means that it must be set up slightly nose heavy, and have an airfoil with a Positive pitching moment. You can use the WebPages way of finding the location if the wing has a tip chord, if it tapers all the way to the tip, just go to the point halfway between the tip and the Centerline of the fuselage. At this point draw a straight line from trailing edge to leading edge. Measure 15-20% back from the leading edge and draw a perpendicular line to the fuselage... that is where the CG will go. If it has a tip chord, use the method in the WebPages and substitute 80-85% in for the 75%... It will need to have an aerodynamic force behind the CG pushing down to counter the weight in the nose so you either need to plan on having extra up elevator throw and always flying with it trimmed up a little. You can use an airfoil with a Positive pitching moment like flying wing airfoils. You can try moving the CG farther back and using less elevator to counter it and see what happens... but start off with a little room to work with.